The solar power industry created 31,000 new jobs last year, a growth rate that was 20 times the national average, according to the fifth installment of the Solar Jobs Census, released today. The new Solar Jobs Census showed that the installation and maintenance of solar power now supports more than 173,000 jobs. 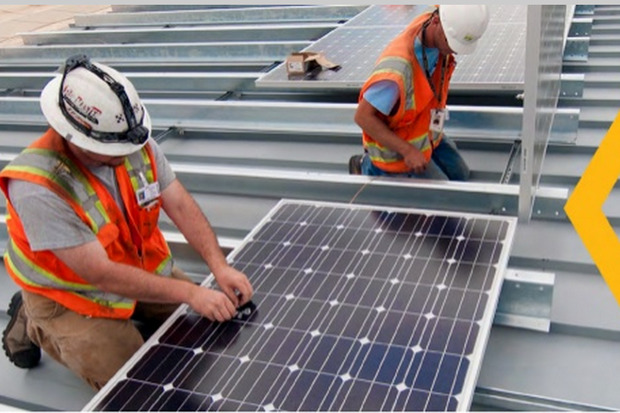 Accounting for some additional jobs in the component and materials supply chain, as well as the industry's spillover effects, there are now more than 705,000 jobs related to the solar power industry. In 2014, 31,000 new jobs were created in the solar industry, which accounts for nearly two percent of all new jobs created in the U.S. last year. Within a few months, the industry will also be providing twice as many living wage jobs for each worker compared to the declining coal mining industry, according to the report. In addition, the solar installation sector added nearly 50% more jobs in 2014 than were created in both the oil and gas pipeline construction industry and the crude petroleum and natural gas extraction industry. In 2013, the solar power industry added 23,682 jobs, a 19.9% increase over the previous year. The National Solar Jobs Census 2014 was conducted by The Solar Foundation and market research firm BW Research Partnership with support from The George Washington University. The research showed that the solar power industry now accounts for nearly 2% of all new jobs created in the U.S. in 2014. Solar products sold by sales and distribution firms in 2014. Last year saw a record high number of solar installations -- capable of producing about 4.9GB (billion watts). That's 50% more solar power installed than the previous year. "The U.S. energy sector is changing rapidly and solar's explosive growth rate indicates solar energy will be a key part of our nation's future energy mix," said Amit Ronen, director of the GW Solar Institute. "Not only did solar create almost two percent of all new U.S. jobs last year, those hires were concentrated in the states where solar is booming primarily because of market-friendly policies." The data was developed by surveying thousands of solar businesses across the country. The data showed that while salaries vary significantly between different solar industry occupations, the wages paid to solar workers are competitive with similar industries and offer many living-wage opportunities. Those surveyed also expect strong job growth this year, predicting more than 36,000 jobs will be added over the next 12 months.That would mark the third straight year of 20% job growth in the industry. 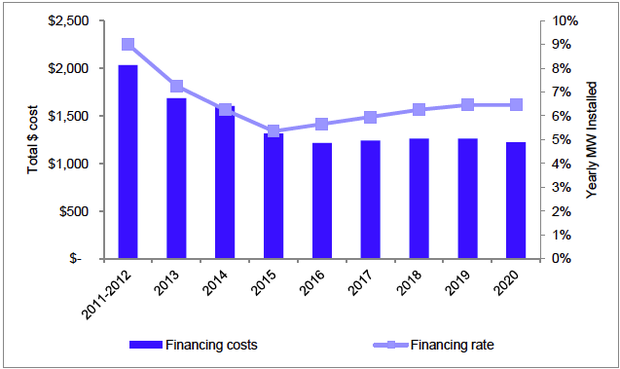 With solar system costs likely to continue to decline, due to scale, solar panel prices dropping 80% over the past five years, and innovative financing and business models, market analysts are also upbeat about 2015. The cost to install and finance rooftop solar power is expected to contine to decline over the next several years, then level off around 2019. "Solar's remarkable job growth is closely tied to rapidly falling solar system installation costs," Ronen said. While 2015 is expected to be another banner year, the upcoming expiration of federal tax incentives and push-back from utilities losing market share may dramatically slow solar job growth in future years." Another factor spurring growth is the impending end of the federal government's solar investment tax credit (ITC). That measure, passed in 2008, offered a 30% tax credit for residential and business installations. When it expires in 2016, the tax credit will drop to a more permanent 10%. "Consequently, we expect to see a big rush of new installations ahead of the 2016 ITC expiration," said Deutsche Bank's leading solar industry analyst, Vishal Shah. 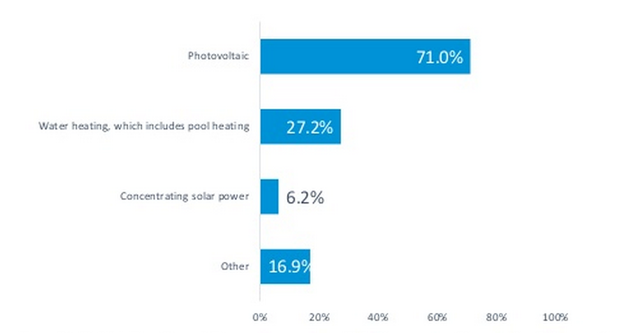 The outlook for the solar industry after the expiration of the ITC is less certain. The higher rate and long term certainty provided by Congress when it authorized an eight-year 30% tax credit in 2008 were key drivers to the industry's recent growth, the report said. However, not every respondent to the census agreed its expiration next year will greatly impact job growth. While, three-quarters of them said the ITC had "significantly improved our business," nearly 40% also said that having only a reduced tax credit after 2016 would not impact their workforce. That may be because a large number of companies related to the solar industry, such as panel manufacturers and makers of solar pool heaters, don't qualify for the ITC in the first place. The survey results may also be an indication that the solar industry sees itself as more competitive with traditional generation sources. And while an October 2014 Deutsche Bank analysis found that extending the 30% ITC beyond 2016 would allow solar to be on par with market electricity rates in as many as 47 states, the study calculated that solar will still reach grid parity in 36 states even if the tax credit drops. Today, according to Deutsche Bank, only 10 states boast solar energy costs that are on par with those of conventional electricity generation methods, such as coal-fired power plants. Those states include Arizona, California, Connecticut, Hawaii, Nevada, New Hampshire, New Jersey, New York, New Mexico and Vermont. Last year, those states accounted about 90% of U.S. installations.